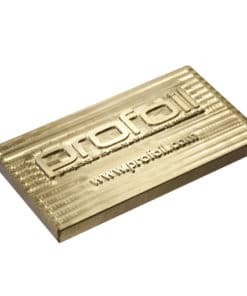 Profoil produces high quality CNC engraved brass dies for hot foil blocking, which are made from high grade sheets of brass metal. An extremely sharp finish is produced with the ability to etch to a maximum of 3mm deep – artwork dependent. Brass blocks can be produced in 6.35mm (UK) and 7mm gauge (International) depths to accommodate your machines type height setting. Medium to long run foiling lengths can be achieved from brass dies where magnesium dies simply won’t last. 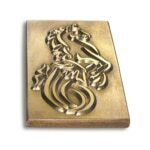 If you order before 12pm, we will dispatch your dies within two working days. It is important that you read and understand our Die Ordering Guide before submitting your order.